For the love of stuffing! Your Thanksgiving table is about to get even more delicious with this gluten-free, paleo & vegan-friendly Sweet Potato Unstuffing. A tried and true recipe. Sweet Potato Unstuffing has been on my Thanksgiving dinner menu for the past several years. 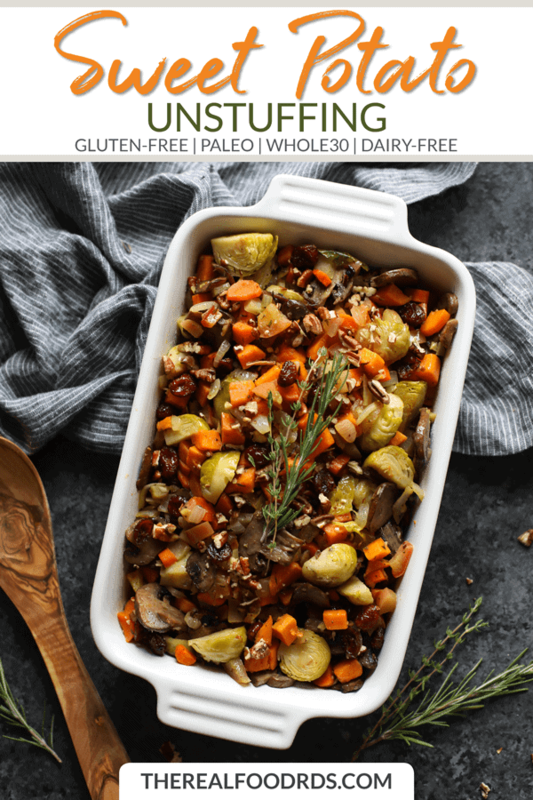 The recipe evolved when I set out on a mission to make a breadless stuffing for a Holiday paleo cooking class I was teaching. And also for my own selfish reasoning because I’m not a fan of traditional stuffing…the soggy bread like texture just isn’t my thing. Anywho, I was determined to make a healthier stuffing option made with only wholesome ingredients….because that’s how us, The Real Food Dietitians, role. I’d say I crushed that mission because this recipe is one of my favorites. I can’t believe I have waited this long to share it! But lucky you, because today is the day! 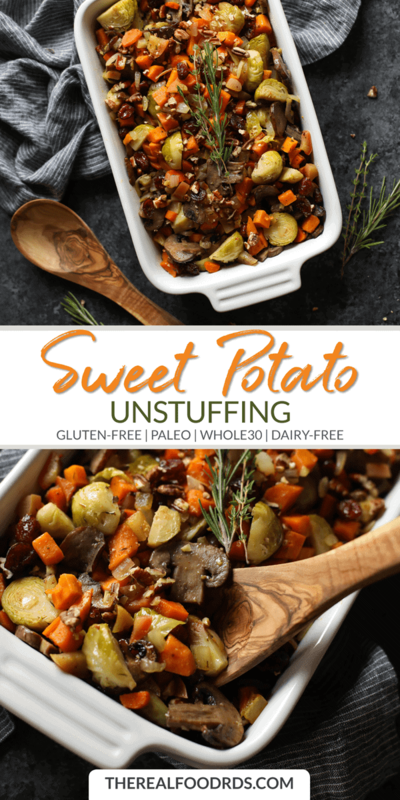 Sweet Potato Unstuffing has the flavor of stuffing but without the bread. A stuffing that won’t leave you stuffed (hence the name..’unstuffing’)! 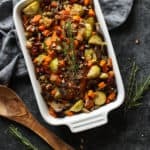 It’s loaded with a variety of veggies and studded with the perfect amount of tart dried cherries, sweet apples, crunchy pecans, and fresh herbs all tossed in delicious avocado oil and roasted to perfection. 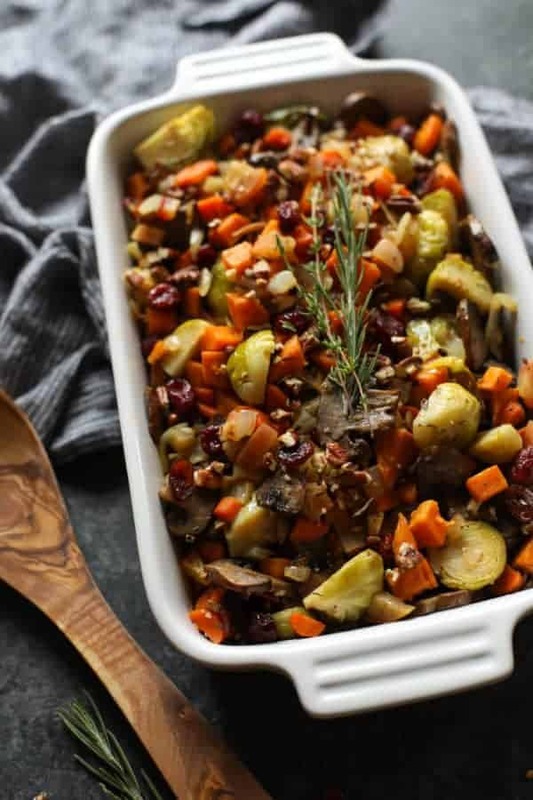 The ingredients come together to create quite a delicious and healthy stuffing side-dish. It makes for a crowd-pleasing Thanksgiving side-dish or it’s easy enough to make for a tasty addition to your weeknight menu. I certainly enjoy this recipe all winter long. This recipe does require a little prep and chopping. I recommend chopping all of the ingredients the day before it’s on the menu. Toss the chopped apple in a little lemon juice to keep from browning. 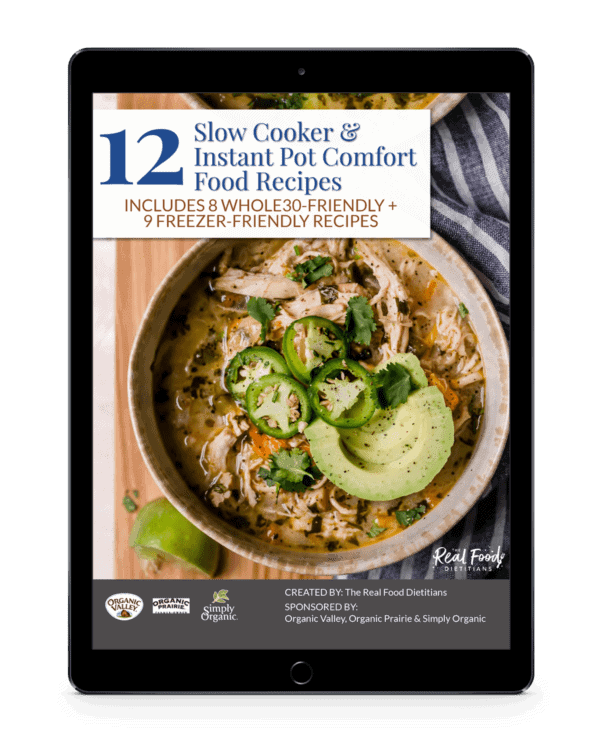 You may also bake this dish up ahead of time (the day you plan to serve it) and then keep it warm in a slow cooker set on low (or the warm setting). That way you can keep your oven open for all of the other delicious foods you may be cooking for your Holiday meal. Sweet Potato Unstuffing is made with a variety of textures, colorful ingredients, and flavors. 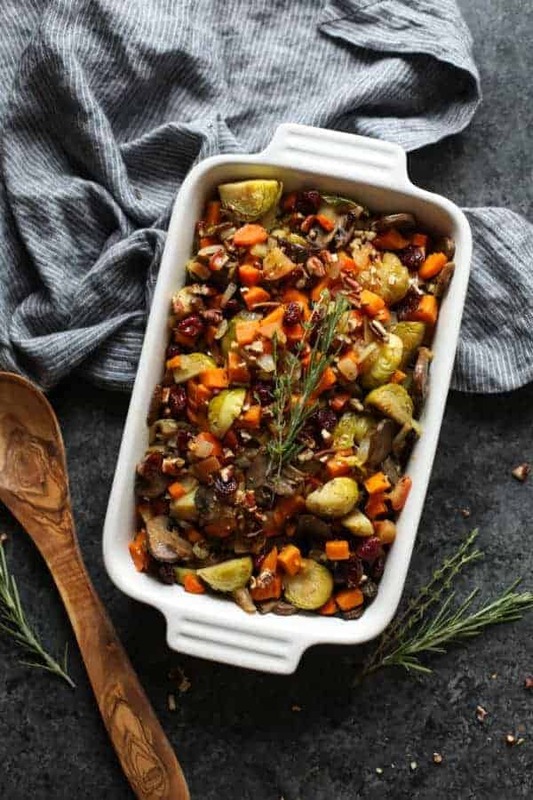 One of my most favorite features of this delicious healthy stuffing is how the ingredients come together to create a variety of textures and flavors. It’s also quite beautiful looking with all of the different colors and perfectly roasted veggies. Every bite is a different experience! Every bite is a mouthful of deliciousness. Now that’s a perfect spoonful! A little bit of everything. 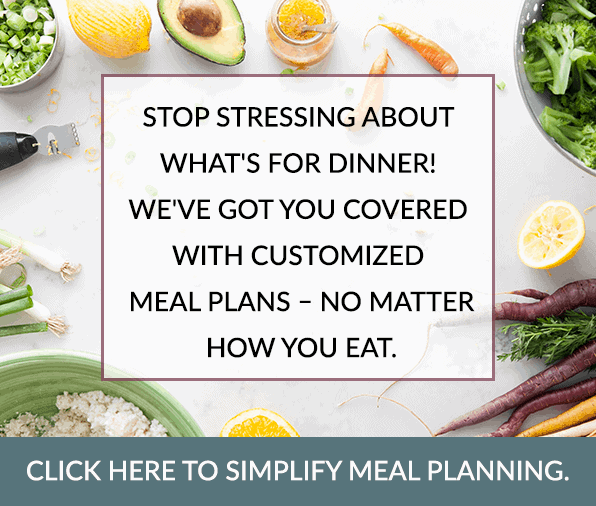 Try for yourself! Add the ingredients to your grocery list and make this Sweet Potato Unstuffing part of your Holiday menu! Sweet Potato Unstuffing makes for a crowd-pleasing Thanksgiving side-dish or a tasty addition to your weeknight menu. It has the flavors of stuffing but without the bread. 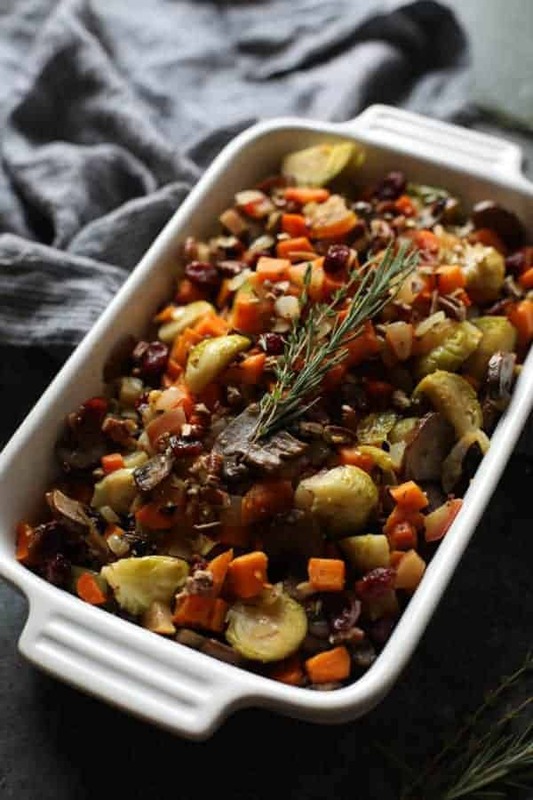 It’s loaded with a variety of veggies with the addition of dried cherries, apples, pecans, and fresh herbs. 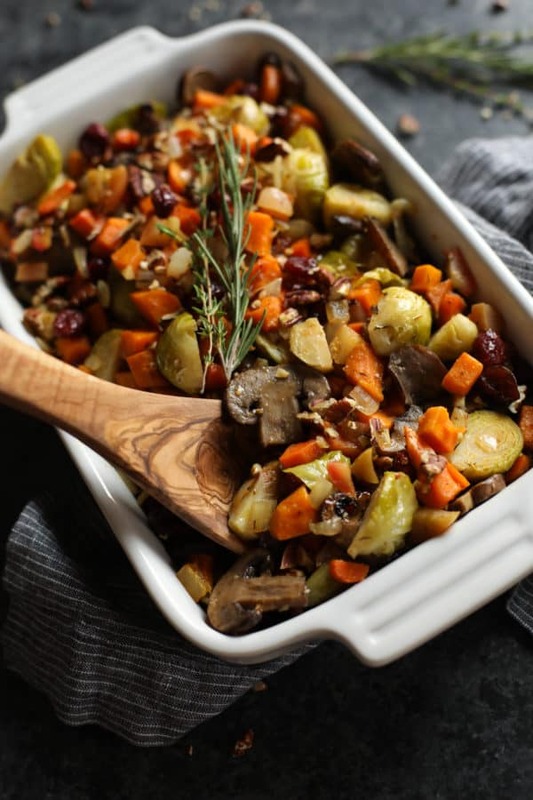 The ingredients come together to create quite a delicious and healthy stuffing side-dish. Transfer to a baking dish and cover with foil. Bake for 30 minutes. Remove foil, add the dried cherries and pecans, toss and then bake for an additional 10-20 minutes longer or until sweet potatoes are cooked through. Prep Ahead Tip: Chop all of the ingredients the day before serving. You may also bake this dish ahead of time (before it’s ready to be served) and keep warm in a slow cooker set on low. Comment below and let us know if you give this recipe a try! This looks great! Is there a preferred specific type of apple? Hi Analysa! Any kind will work in this recipe. Enjoy! Due to nut allergies, I can’t add the pecans. I imagine the crunch adds to the appeal of the dish and am curious if you think there might be a good alternative. Would sunflower or pumpkin seeds be a good alternative? Hi Jen! Yes, you certainly can sub the pecans for sunflower or pumpkin seeds. Enjoy! I made this last night and found myself smiling during dinner. This recipe is absolutely fabulous! Thank you. Awesome! It is such a delicious dish. I make it all year round. In fact, I had some last night too and leftovers today! I’m about to make swordfish for a dinner party of ten, do you think this would be s nice side for fish? Hi Holly! Yes. This recipe could be served with really any meal. Not just Thanksgiving dinner 🙂 It’s so good! 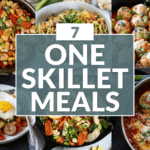 Have you tried this using butternut squash or regular potatoes instead? I’m making candied yams along with this and didn’t want to over-do the sweet potatoes/yams. Now that I’m thinking maybe even rutabaga would work too. I’m drooling thinking about it. Yes, those substitution would definitely work! Rutabaga…yummmmm! I love this recipe. 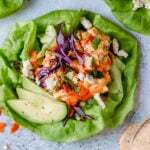 Tastes great – is filling – healthy and even freezes ok. However, it’s never this pretty. It all because a dull color. Is there a way to keep the carrots and sweet potatoes orange? I am thinking of raising them separately and adding just before serving. You could definitely try roasting them separately and add them in before serving. 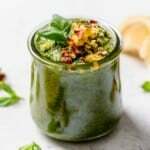 Would this work well to double the recipe? I need to serve more than 8 people. 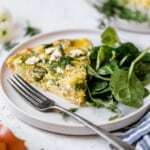 thanks so much … this recipe looks amazing … do you think a good quality olive oil would work instead of avocado oil? thoughts are appreciated! Yes, olive oil will work in this recipe though it may have a more pronounced flavor. This recipe looks great! Can it be made the day before? It can be made the day before and reheated but the colors may not be quite as vibrant the next day. I’d suggest baking it for slightly less time than the recipe calls for so that when you do reheat it you’re not overcooking the vegetables. Hope that helps! Can you make in the crockpot instead? We haven’t tested the recipe in the slow cooker so I can’t say for sure how it would turn out. The only issue I can foresee is that the vegetables wouldn’t get as caramelized as they would if you made the dish in the oven. 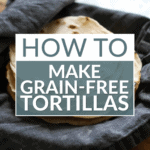 If you try it in the slow cooker we’d love to hear how it turns out for you! This was phenomenal! I added Parsnips because I love them! Thanks, Jessica! Great idea to add parsnips – they add so much flavor. Looking forward to making this for Thanksgiving! I am just concerned about it getting too soft in the slow cooker, but I will have to keep it warm this way. I am taking it to dinner, so will have to make it ahead of time. Tips? Hi Autumn….you can keep the slow cooker setting on warm and you should be good. That’s how I serve it when I bring it to Thanksgiving. If it gets too warm even on the that setting, you can turn the slow cooker off for a bit. Enjoy! I am traveling to celebrate with family 2 hours away. Can I make this the morning of and carry? What a good way to reheat once at our destination? 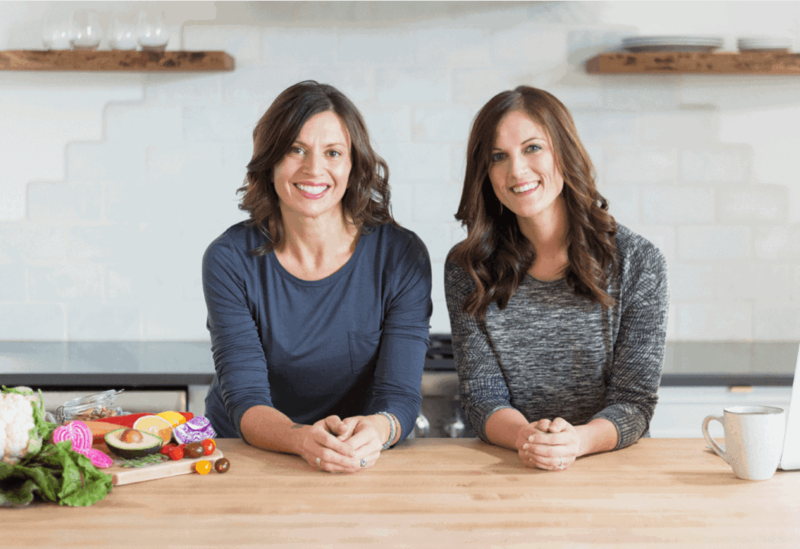 Can mushrooms be opted out? Hi Rese….Yes, I make this in the morning before my thanksgiving gathering and transport it in a slow cooker. 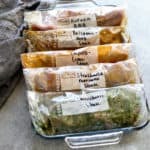 I turn the slow cooker on warm or low as soon as I get to my destination. You could omit the mushrooms and maybe add zucchini instead or another veggie of your choosing. Enjoy! Can I substitute another oil for avacado? I am allergic. Thank you! Absolutely, sub whatever oil you would like or have on hand. Hi Karen. You could certainly omit the Brussels Sprouts and just add a little extra of all of the other veggies. Or parsnips would be good, too!